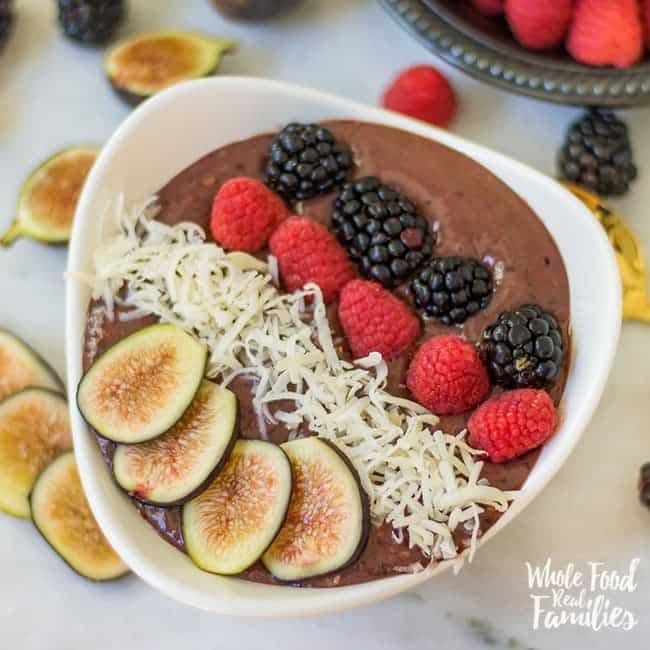 This Acai Smoothie Bowl is a new addition to my breakfast rotation, much to the excitement of my kids who are sick of the normal school morning routine. It is fast and tasty and uses only natural fruit as the sweetener… no sugar here. The fruit bowl is aways overflowing at my house since whole fruit is the go-to snack around here. Running out of fruit is a recipe for disaster since my kids are different ages, have different schedules, and get hungry at different times. So having a nice selection in the bowl makes life easier for everyone, including me! 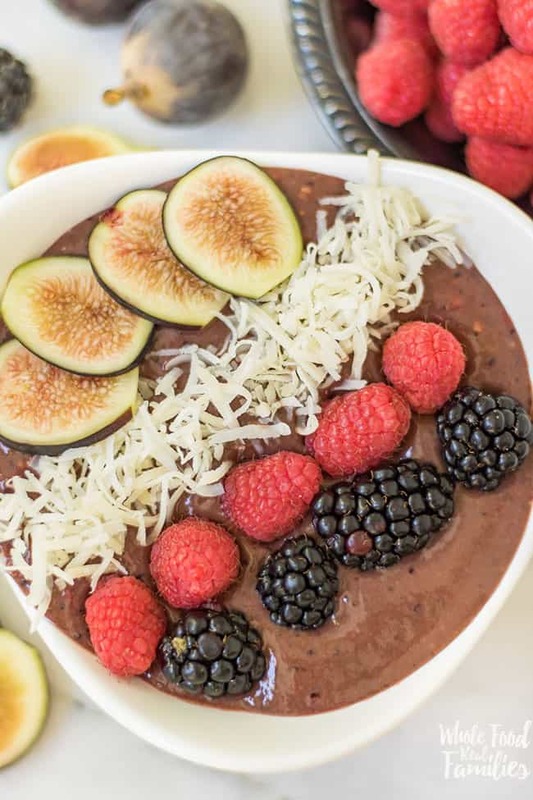 I was slow to the Smoothie Bowl phenomenon that took over Pinterest – thinking my little kids would just make a hot mess with an open-faced smoothie. But when some fruit was languishing in the fruit bowl and needed to be used up, it became a good time to experiment. Many, many, many moons ago – long before smoothie bowls were cool – I had a dear friend who was South American. It was on a trip together that I first tried Acai – and it was the first smoothie bowl I had ever had. There was a little stand set up outside of a sporting event selling Acai Bowls. I didn’t have a clue what it was, or how to pronounce it, but my friend’s face it up like it was Christmas. Clearly, it was a taste of home for her and her enthusiasm made me excited too. Recently I passed unsweetened Acai packets in the freezer section of the grocery store and thought of that experience and decided to give them a try again all these years later. The result was this Homemade Acai Smoothie Bowl that my kids all love. And subsequently became a very viable way to use up any fruit hanging around the fruit bowl. Why Acai Packets from the Freezer? The Acai berry many health benefits. But the value is hard to keep intact while shipping the whole acai berry all over the place. So the best way to do keep the nutrition intact (though not perfectly) is to freeze the processed pulp. The frozen packet is really handy because you don’t have to worry about it spoiling quickly. Do check the ingredient labels on any frozen packs you find. Some brands add sugar, some don’t add any, some add just a little. So make those choices on purpose. The recipe has no added sugar, and it can also fit into a vegan meal plan. 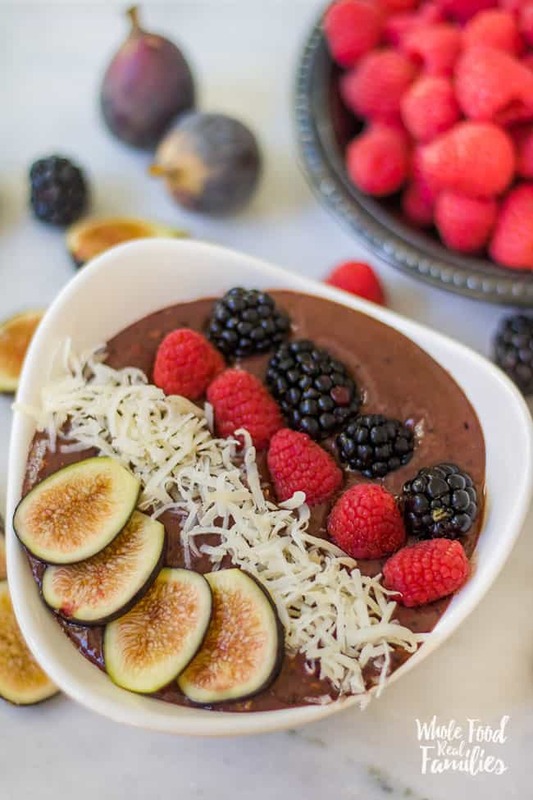 The secret to the rich consistency to the smoothie bowl is not only the berries but the addition of the banana. Normally, I add ice (ice is optional) to the fruit mixture to make it nice and cold. The consistency is a little thicker than regular smoothies, making it not the hot mess I expected when I handed my kids a spoon instead of a straw. 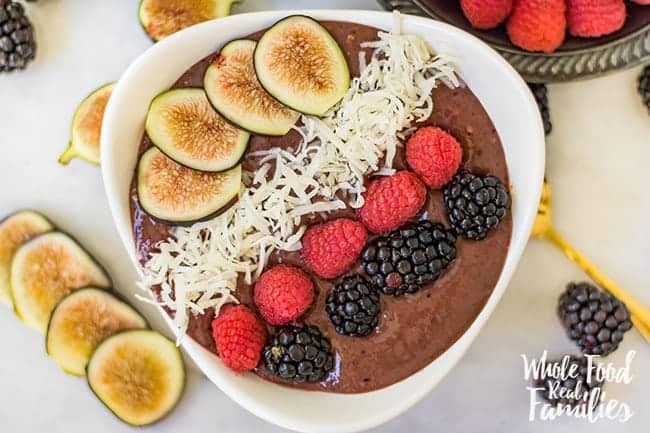 There is very little prep time for this Acai Smoothie Bowl recipe. So it is PERFECT for breakfast before school! Looking for more Smoothie Recipes? 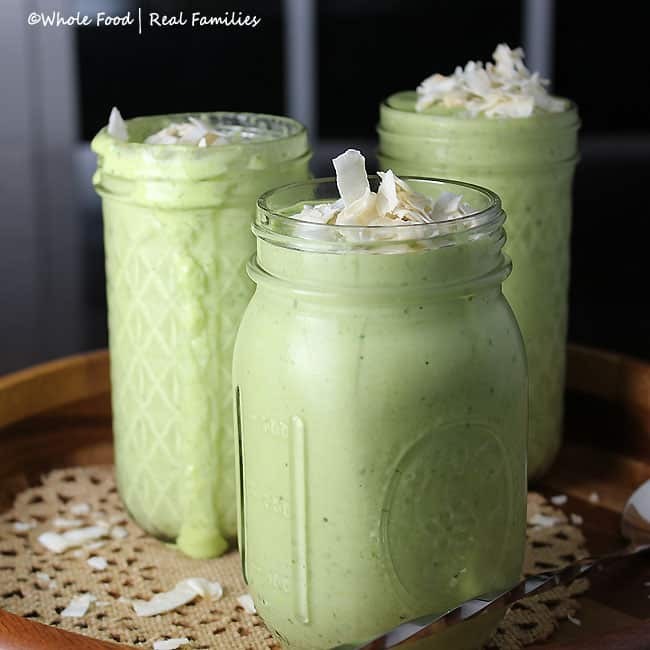 This Green Pina Colada Smoothie is one of our very favorites! And great for sneaking in the veggies when nobody is looking. 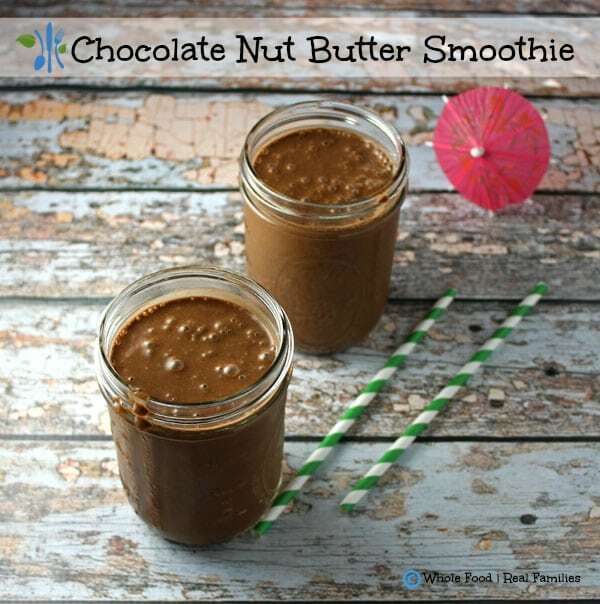 This Chocolate Nut Butter Smoothie is hands down the family favorite. Who doesn’t want chocolate for breakfast! Chocolate Nut Butter (Spinach) Smoothie. Blend everything until smooth. Pour in bowl and top off with your favorite fruits/berries, shredded coconut, chia seeds, or nuts. Enjoy right away!